We regretfully inform you that the final day of operation for WYFR will be June 30, 2013. This station descended from W1XAL (an experimental class license assigned in 1927). In 1939 the call letters were changed to WRUL, and then changed to WNYW in 1966. Initially, broadcasts came from Boston. In 1936 the station moved to Scituate, Massachusetts. On October 20, 1973 Family Stations, Inc. took ownership of the station using the call letters WYFR. (FSI had been buying airtime from WNYW starting in January of 1972.) At that time, the station sported four transmitters and nine reversible rhombic antennas. Construction started in Florida in 1976. On November 23, 1977 the first transmission from Okeechobee went on the air. 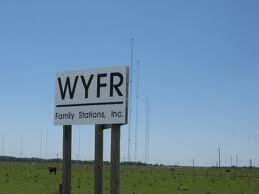 For several years WYFR operated simultaneously from Scituate and from Okeechobee. The last broadcast from Scituate took place on November 16, 1979. The Okeechobee site eventually grew to 14 transmitters and 23 antennas. And now we’ve gone full cycle. This entry was posted in Broadcasters, News and tagged Dan Elyea, Harold Camping, WYFR on June 18, 2013 by Thomas.